While everyone is waiting for the thrilling possibilities of iOS 11.1 the sad truth remains that Apple iOS 11.0.3 is creating a lot of problems for its users. And now even the most faithful followers of Apple have begun to recognise this. Famed ally AppleInsider wrote addressing this topic, stating that, problems such as battery life and instability propagate through social media and Apple support forums and many of these problems don’t seem to have a common origin and are neither solved easily. More relevant to the point, AppleInsider points out postings where users have bombarded Apple with many complaints. Apple’s Official Support Communities forum shows a post where multiple reports of problem with iOS 11.0.3 have been made but in particular, the really terrible battery life has more than 1200 endorsements proving to Apple that “I have this question too”. A post on Reddit by one owner describes how his iPhone’s performance has gradually gone downhill after upgrading to iOS 11.0.3 and this post has over 400 comments, where almost all relate with the poster. And this only worsens from here on. A second Reddit thread describes a drop in performance and stability problems and the poster asks how common other users are finding this. This received over 2000 comments in support to the problem described. Temper levels are also on the rise. Users that are affected are arguing that it’s a disaster and unaffected users are contradicting that saying they are unaffected and that there is absolutely no problem. However, neither of the viewpoints is useful. It is clear that each and every single iPhone, iPad or iPod touch is not affected, but it is also equally clear that a considerable number are. AppleInsider itself clarifies this point saying that it has observed iOS 11.0.3 running well on a pair of iPad Airs, iPhone 7 Plus and an iPhone 6S that it has but other iPads and iPhones are facing problems which includes an intense effect on its battery life. This issue of battery life specifically seems to be a very dreadful problem for many. A simple search on Twitter shows thousands of complaints pertaining to only iOS 11.0.3 battery life and the software, not the hardware, appears to be the cause of the problem. 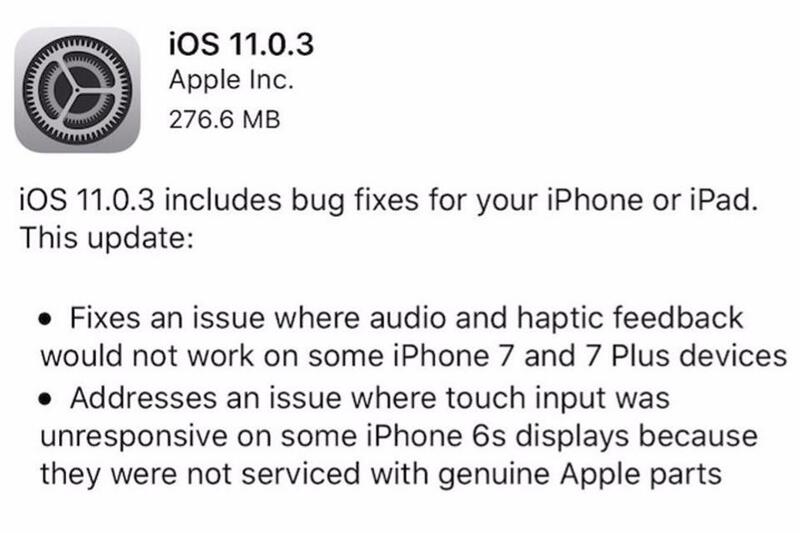 AppleInsider studied the data set gathered from Genius Bars since the 2016 ‘Touch Disease’ problems and concluded that authorised hardware repairs saw no significant increase and thus there had to be a problem with iOS 11 itself. There is good news is that there may be hopes for battery life in particular as the latest betas of iOS 11.1 are showing huge improvements. But this is just one particular issue and notes that have been released so far alongside the iOS 11.1 betas did not show it will make the truck-load of fixes in demand by many, at least officially. Apple iOS 11.1 will be likely to be launched in the next 1-2 weeks, but it would be beneficial to sign up for the Apple Beta Program if one can’t wait. For the moment, Apple needs to keep in mind that even though they are very focused on the super smart iPhone X, the company cannot risk leaving behind their faithful customers who are still using older models.